Polar has released A300 not long after M400. The A300 is meant to be a scaled down version of the M400 for people who only need the basic functions. So, which fitness tracker should you choose? 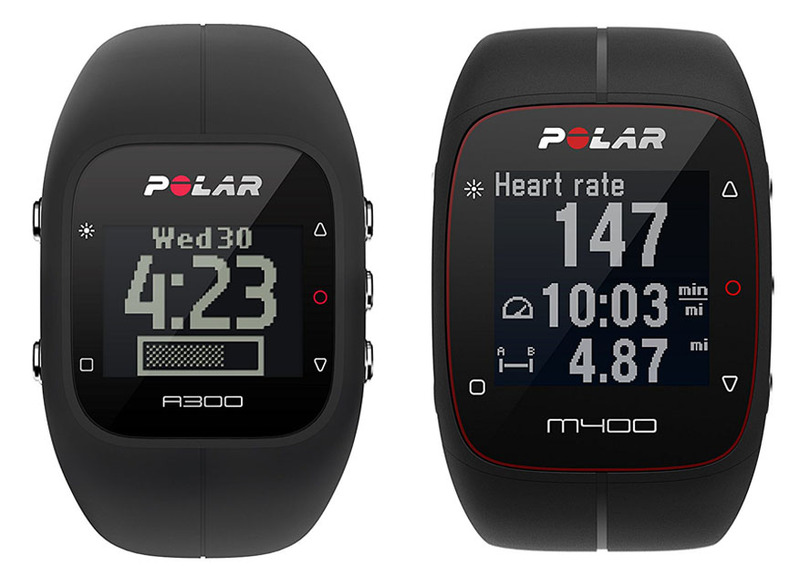 Continue reading below for the detailed comparisons between Polar A300 vs M400! – Which fitness tracker has the best value for the money. In terms of design, Polar A300 does have a nice advantage of having colorful interchangeable straps. There are at least four color choices of black, white, yellow, and pink. Nevertheless, the unit is slightly thicker than its predecessor. The side buttons are more prominent. However, the display screen is actually a little bit smaller. It shows less information at a time, so you need to swap the screen to see other statistics. On the other hand, Polar M400 is very slim and lightweight. It is available in several color choices including black, white, red, blue, and pink. It is very comfortable to wear. The display is wider and able to show more information at the same time, thereby reducing the need to swap the screen. Both models are waterproof. No need to worry about sweating or rain. You can even use them for swimming, although they have different swimming features. Interestingly, these two fitness trackers come with different quirks. Nevertheless, in general, Polar M400 is better, as it comes with more features and capabilities. The advantage of Polar A300 is that it can track your heart rate while swimming. This may be a nice advantage for dedicated swimmers. In addition, it comes with nice vibration alerts. It has an activity tracker that will alert you when you’ve been inactive for a long time, encouraging your body to stay active. However, its tracking capabilities on other aspects are rather limited. It does not have built-in GPS. Well, according to Polar, A300 is already able to show incoming texts and calls. It also has social media notifications. On the other hand, Polar M400 is a better fitness tracker as a whole. It can track more detailed statistics. It has a dedicated swimming mode, albeit without heart rate tracking. Still, there are useful features such as interval timer, interval trainer, sports profiles, manual/automatic laps, ZonePointer, ZoneLock, and configurable displays. This model has built-in GPS, so it can track your location, path, and distance. The software has been updated to support smartphone notifications, so it will be very handy. Finally, don’t forget to consider the battery life. Polar A300 generally has longer battery life due to the fact that it does not need to power any GPS sensor. The average battery life varies from user to user, depending on how you use it. People say that it can last for more than a week per charge with daily use. On the other hand, Polar M400 needs to be recharged more frequently. It can last for about 8 hours with the GPS turned on. You may want to turn off the GPS when not needed in order to preserve the battery life. We recommend you to choose Polar M400 because of the wider range of features and capabilities. This model will be more useful and beneficial, as it can track more statistics and perform more functions. It has built-in GPS and smartphone notifications.